Peppermint Publishing Presents: "The Adventures of Lollipop" series by Jennifer Cuthbert! Follow Lollipop and Friends on Social Media! The Adventures of Lollipop is a children's/all-ages comic book series by Canadian author/artist Jennifer Cuthbert Lam. 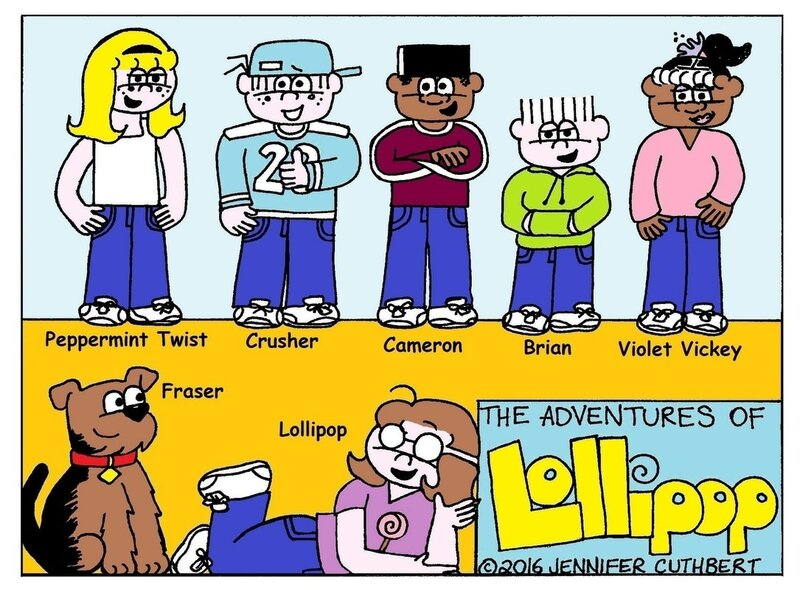 In each Adventures of Lollipop comic, a girl named Lollipop and her group of friends travel the world, exploring different countries, places, cultures and time periods, all while learning fun facts about each setting. Browse this site to explore the different titles available, learn about the author presentations and comic workshops available, and visit the "Comic of the Week!" page every week to see featured comics! Lollipop (the leader): Lollipop is a curious, imaginative and adventurous girl. She is the leader of her group of friends and is always encouraging, enthusiastic and ready to explore. Lollipop is always happy and upbeat! Peppermint Twist (the diva): Peppermint Twist is Lollipop's friend. She is the popular girl of the group. Peppermint Twist is a diva who loves to be the centre of attention! Violet Vickey (the encyclopedia): Violet Vickey is Lollipop's friend. She is the smart, serious one of the group, the opposite of her twin brother Cameron. She has a wealth of knowledge about all of the places the gang travels to! Crusher (the jock): Crusher is also Lollipop's friend. He is the tough, sporty boy of the group, hence his name. He is always up for a challenge and follows his own rules! Miss Pink (the teacher): Miss Pink is Lollipop's teacher, a spunky old lady who keeps her students on their toes! Her lessons and field trips often inspire many of the gang's adventures. Fraser (the dog): Fraser is Lollipop's dog, an Airedale Terrier who often causes mischief and somehow sneaks along on the gang's adventures. Although Fraser can cause mischief, he often saves the day! Cameron (the foodie): Cameron is Lollipop's friend and Violet Vickey's twin brother. Unlike his serious sister Violet Vickey, he is a joker. He also has a large appetite and is always hungry. His passion for food makes him an expert on foods of the world. He also loves to play video games! Brian (the little brother): Brian is Lollipop's little brother. He tags along on the gang's adventures and asks many questions. He also has a not-so-secret crush on Peppermint Twist, and goes to great lengths to get her attention, only to be rejected every time!